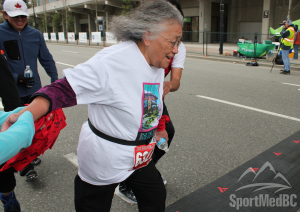 The Aboriginal RunWalk Program (ARW) is designed to help participants gradually build fitness levels and increase their stamina in preparation for a 5 or 10K running or walking event. The ARW program has successfully been delivered since 2007 with over 800 leaders trained, reaching over 15,000 participants across the province. ARW leaders are trained through the Healthy Living Leader Training Sessions, delivered in partnership with SportMedBC. ARW leaders receive training and resources in program planning and delivery CPR First Aid certification, Sports Injury, Nutrition and more. Trained ARW leaders (those who completed a two-day training session) apply for an AHLA grant to assist with developing and hosting their community RunWalk program, which can include the cost of organizing a National Indigenous Peoples Day 10K event.